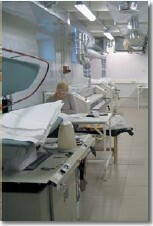 “White Bear” is one of the most modern laundry and dry cleaners not only in Saint-Petersburg, but in the whole country. 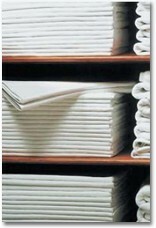 For 14 years already “White Bear” has specialized in handling bed linen, table clothing and work clothes. The quality of our services remains the same due to the use of the newest equipment of European brands and the most modern professional cleaning agents. Operation – AROUND-THE-CLOCK! Our business does not stop for a minute; we process the clients’ order 24 hours a day on weekdays, weekends and holidays. Accurately meeting the deadline – ALWAYS! 3 laundry units and a dry cleaning unit are currently operating. The capacity of laundry amounts to 150 tons of washing a month. This structure completely eliminates delays in processing the washing due to technical reasons (equipment breakdown, power shutdown, etc.). Our in-house transport and logistics service allows flexible delivery of laundry there and back round-the-clock without days-off or holidays. This work schedule is much more reliable than using the services of third-party transportation organization. Fast fulfillment of orders – PRACTICAL! Production capacities of “White Bear” Laundry and dry cleaners allow processing our customers’ orders within 5-8 hours from receiving them. This gives you an opportunity to save on the number of linen and uniform replacement sets. 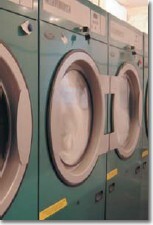 OUR SERVICES: We understand that the needs of our clients are not limited by the services of laundry and dry cleaners. Today you can have a whole set of “one-stop” services: making linen and uniform, laundry and dry cleaners services as well as free rent of bed linen and table clothing. Free Rent of Linen Rent Department is ready to offer you the service that is new to Russia, but long since widely popular on the laundry services’ market of Europe – rent of bed linen and towels for the hotels. You no longer need to buy linen and bear additional organization and administrative expenses or storage and logistics expenses. When you use the linen belonging to the “White Bear” Laundry and dry cleaners you only pay for its washing. Work clothing, clothing for security service, medical staff and other specialties. Our production allows fulfilling any wish of yours in the shortest time: application of logo (thermo-printing or embroidery), individual marking and many others.